Passing dark urine that is dark yellow or dark brown could mean something as simple as being dehydrated, or it could be as serious as a problem with your liver. In other cases, dark colored urine that is brown, orange, tea colored or even black can be caused by certain foods, medications, a urinary tract infection, or other health issues. In most cases, there is nothing to worry about if you have noticed that your pee has turned a darker color. When urine becomes very dark for a few days, you may need to see a doctor to get some tests done. Usually, extremely dark urine caused by a liver problem or gallbladder issue will cause other symptoms. These could include sudden upper right abdominal pain, yellowing of the skin, and a fever. In many cases, treating the symptoms of passing dark pee involves drinking more fluids to dilute the concentration of organic compounds in urine. In more serious cases, doctors will treat the underlying medical issue to resolve the problem of passing deep amber or brown colored urine. 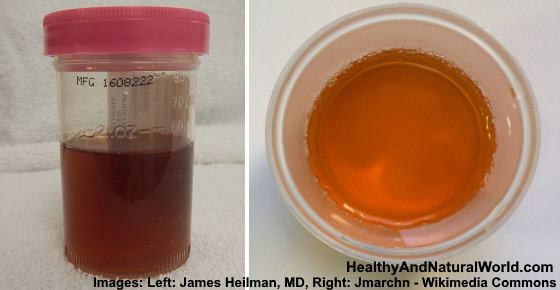 Healthy urine looks like a light pale straw-colored liquid to a golden color. The typical yellow color of urine comes from a pigment (urochrome) found in urine. Differences in the shades of yellow range from very light yellow to amber depending on the concentration of urochrome. Very often, your first pee in the morning will produce urine that is darker than normal because it is more concentrated. This type of dark, gold-colored urine in the morning is usually perfectly normal. This is especially true if your urine throughout the day is pale yellow. What Does Dark Urine Mean? According to Dr. Khatri, the most common reason for passing dark yellow, brown or tea-colored urine is dehydration. This type of dark urine means that you need to drink more fluids immediately to prevent any complications of dehydration. Sometimes light pink urine could be because of eating beets. However, dark red urine could mean that there is blood in your urine caused by a urinary tract infection or kidney problem. The presence of blood in urine that makes urine pink, very red, or black is often referred to as hematuria. To diagnose the underlying condition, your doctor will probably arrange for you to give a urine test to check for unusual particles in urine. Let’s look in more detail at the most common reasons for what it means if your urine is dark. When your pee is very dark yellow, it doesn’t always mean that you are suffering from a liver or kidney problem. Urine that is unusually dark could be a sign that you have to drink more water. Drinking more water daily is usually all you have to do to treat dark urine that has been caused by dehydration. Some foods can turn your pee a darker color than normal and can even turn your urine dark brown. There is nothing to worry about if certain foods have turned your pee a dark yellow color. When you change your diet or stop eating those foods, your urine should return to a healthy light-yellow color. Some drugs and multivitamins can turn your urine dark because of how they interact with compounds in your pee. Heatstroke is a medical emergency that can affect the function of your kidneys and cause rust-colored urine. To test for symptoms of heatstroke, doctors will usually take a urine test to see if the urine is dark due to kidney problems. Passing dark urine that looks tea-colored or rusty red along with a burning sensation could mean that you have a urinary tract infection. To help quickly treat the symptoms a mild UTI, it’s important to act quickly. One of the best natural treatments for a UTI is D-mannose. You can also regularly take probiotics to help improve good bacteria in your body to prevent recurring UTIs. For other natural treatments please refer to my article on how to treat urinary tract infection. Gallbladder stones can cause excruciating right upper abdominal pain and cause you to pee extremely dark urine. You can use diluted apple cider vinegar to help dissolve the cholesterol buildup and get rid of gallstones naturally. Most doctors recommend sticking to a healthy diet that includes plenty of fiber to prevent gallstones from forming. Liver cancer. Some of the symptoms of liver cancer can include jaundice and dark urine. To help look after the health of your liver, it’s important to drink enough fluids daily, cut down on excessive alcohol use, and get enough sleep. A type of anemia called hemolytic anemia can cause the early destruction of red blood cells and cause your pee to look rusty-brown. It’s important to make sure that you get enough iron and vitamin B12 in your diet to prevent anemia. There are some other, less common, reasons why you could pass really dark urine. Mononucleosis. Mononucleosis (mono) usually just results in fatigue, a sore throat, and swollen glands. However, the Encyclopaedia Britannica says that in severe cases of mono, a person may have hematuria – the presence of blood in urine. What Causes Dark Urine in the Morning? It is very common for your urine to appear darker in the morning because your urine is more concentrated. A lack of fluids during the night and possibly slight dehydration will make your first pee in the morning a darker yellow color. If you drink enough water throughout the day, your urine should become a pale-yellow color. Flushing your urinary system in the morning is one reason to start the day with a glass of water. Doctors also recommend that the best time to get accurate results from a pregnancy test is to take it first thing in the morning. What Causes Dark Urine in Pregnancy? If you are pregnant, you might find that your pee is a darker yellow color than normal. For many women, dark urine during pregnancy just means that they need to drink more water. According to doctors from the American Pregnancy Association, you need to increase your water intake if you are pregnant. Adequate hydration during pregnancy helps to keep your important bodily functions healthy. It also assists in the development of your baby. A clear sign of dehydration during pregnancy is passing dark yellow pee. While urine can become extremely dark due to extreme hydration, kidney problems, or liver disease, it is very rare to pass black urine. In fact, this is sometimes referred to as “black urine disease.” The first signs of alkaptonuria may develop in people who are in their 20s or 30s. As well as peeing black tainted urine, gray spots in the eyes may start to appear, and ears may turn a bluish-black color. Normal urine is a light yellow to golden color, and as long as your urine becomes lighter when you drink more fluids, you shouldn’t have anything to worry about. However, if you persistently pass dark urine or your urine turns another color other than various shades of yellow, you may need to see a doctor. You notice signs of blood in your urine that may or may not be accompanied by pain. You have symptoms of a urinary tract infection like passing cloudy dark urine. Your urine turns a deep amber or you pass orange urine, as this may be a sign of liver dysfunction. Dark colored urine is accompanied by nausea, fever, or cramping pain in your side or back. Cloudy Urine: What Does It Mean and Is It a Reason for Concern? Clear Urine: What Does It Mean and Is It a Reason for Concern?